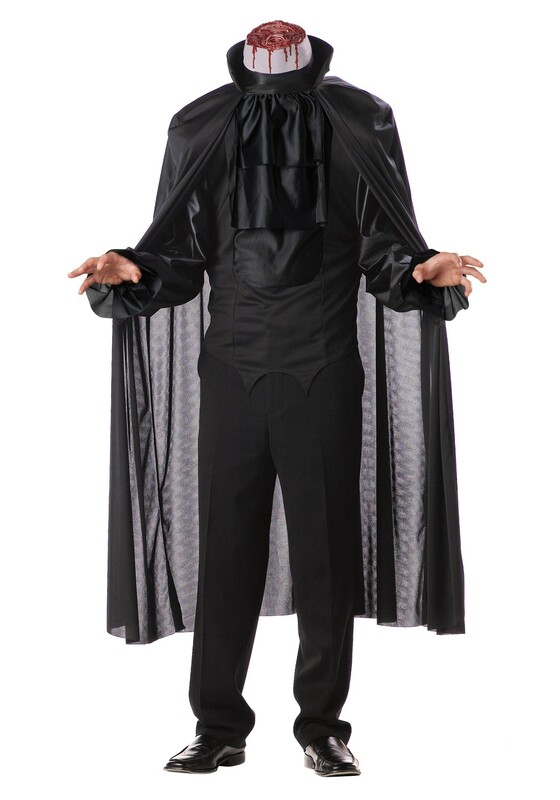 This Halloween season, bring the legend of Sleepy Hollow to life in this Adult Headless Horseman Costume, and persuade Ichabod Crane to leave Sleepy Hollow! Wear it with your own black pants, or buy ours, and add black boots and gloves; and for an even more realistic touch, carry one of our pumpkins as a prop. to complete the spooky look.Contrary to what some might mistakenly think, Crane himself was NOT the Headless Horseman. He was the local schoolmaster, a very superstitious man whose marriage proposal to the daughter of a wealthy local farmer had just been rejected. Late at night he was riding his horse back to the fictional village of Sleepy Hollow when he encountered a cloaked rider. Ichabod had heard local stories of a Revolutionary War soldier who haunted the area after having his head blown off by a cannonball; sightings of the Headless Horseman were said to be an omen of death. Ichabod Crane was never seen in Sleepy Hollow again. The next morning his unsaddled horse was found wandering, the saddle trampled, and a smashed pumpkin lying alongside Crane's hat beside the road.